Lino Lakes Correctional Facility is a medium security prison located in Minnesota. It is a mixed custody facility that houses over 1,300 adult males. 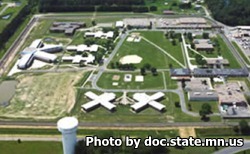 Medium custody inmates are housed within the main institution, minimum custody offenders are housed just outside of the perimeter. Selected minimum custody inmates work supportive roles within the prison cooking food and performing maintenance jobs. Many inmates serve their final months at Lino Lakes because of the pre-release support services this prison offers. Offenders can receive substance abuse treatment in the TRIAD 380 bed chemical dependency program. Academic and vocational opportunities are also available. You must arrive at least one hour prior to the close of the visiting time or you will not be processed into visitation. General Population has visiting on Thursdays and Fridays from 11:45am-9pm (registration is closed between 3:45pm-4:45pm). General population also has visiting on Saturdays and Sundays from 8:45am-6pm (registration is closed 10:45pm-11:45pm and from 3:45pm-4:30pm). Segregation inmates have visits on Saturdays and Sundays from 9am-10am, 10am-11am, 12pm-1pm, and 1pm-2pm. Maximum Security Mayo has visiting hours on Tuesdays and Thursdays from 6pm-8pm, Saturdays from 3pm-5pm, and Sundays from 6pm-8pm. Maximum Security Sibley has visiting hours on Wednesdays and Fridays from 6pm-8pm, and Saturdays from 6pm-8pm, and Sundays from 3pm-5pm.